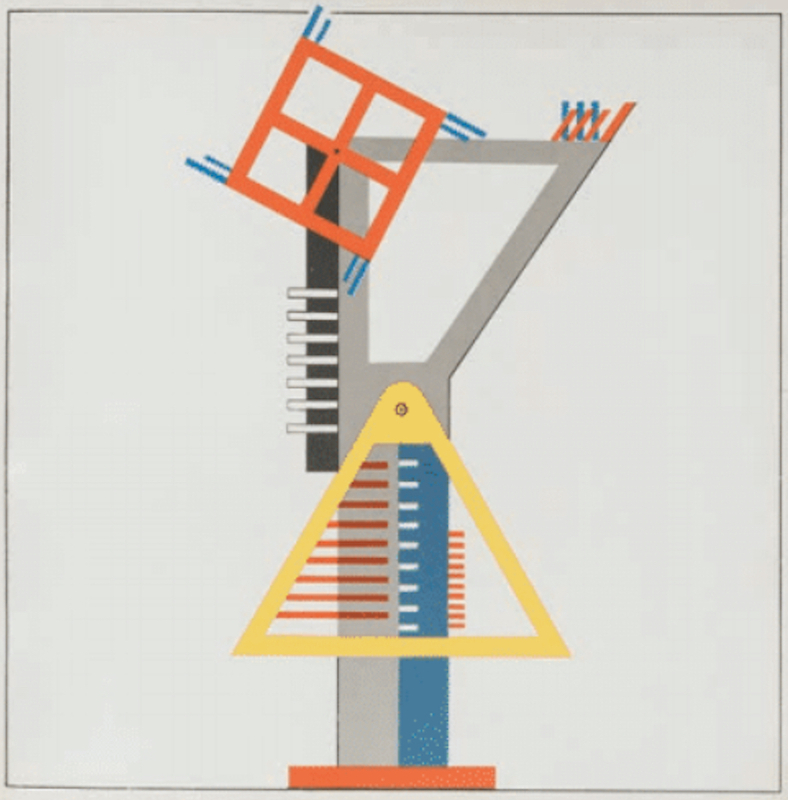 Kurt Schmidt, Construction for Fireworks, from the Stage Workshop, 1923, Lithograph/reproduction 2017 will be one of the items on display in the “The Whole World a Bauhaus,” an international traveling art exhibition Feb. 23 through April 20 at the Elmhurst Art Museum, 150 S. Cottage Hill Ave.
rship supplements the cost of tuition, books, supplies and other school-related items for a semester or a quarter to offset the student’s needs. This scholarship is funded by the Illinois Department of Commerce and Economic Opportunity. Applicants have to provide proof of DuPage County residency, gross household income for the past 90 days and information about members living in the household. Household income must be at or below 125 percent of the federal poverty level. Applicants must also include a 500-word essay or personal statement, official school transcripts, two letters of recommendation, a financial aid award letter and proof of enrollment in an Illinois accredited institution. The scholarship amounts will vary from $500 to $2,500, and special consideration is will be given to students interested in high-technology fields or other occupations in emerging fields. Applications are available at the DuPage County Department of Community Services Office, 421 N. County Farm Road, Wheaton, and online at dupageco.org/CSBG. Deadline is 4:30 p.m. May 3. For more information, contact the county office at 630-407-6500 or 800-942-9412. TTY access is available at 630-407-6502. Shipping and transportation problems have delayed the only U.S. appearance of The Whole World a Bauhaus, an international traveling art exhibition coming to Elmhurst. The exhibit celebrates the centenary anniversary of Germany’s influential Bauhaus school of art and design, at its height from 1919 to 1933. Its arrival at the Elmhurst Art Museum has been postponed one week because of a slowdown in cargo handling and subsequent transportation delays from Mexico City, Mexico. The exhibition will now open Feb. 23 and continue through April 20. Complementing this broad, historic survey is a range of contemporary art and design programming for all ages, including unique site-specific works within the museum’s Mies van der Rohe McCormick House, now through April 14. Artist Caudia Weber is living in the house and creating installations, interacting with visitors and hosting events. The Elmhurst Art Museum, 150 S. Cottage Hill Ave., is open 11 a.m.-5 p.m. Tuesday-Sunday. Admission is $12 for adults, $10 for seniors and free for students and children under 18. For more information, call 630-834-0202 or visit elmhurstartmuseum.org. Quindlen will speak about her new book and new adventures at 7 p.m. May 1, at Stevenson Hall on the campus of North Central College, 131 S. Loomis St., Naperville. Her appearance will be presented by Naperville’s Anderson’s Bookshop. Quindlen will participate in a moderated discussion about her book and then sign books and pose for photos. Tickets are available exclusively at NanavilleAndersons.brownpapertickets.com. Before blogs existed, Quindlen became a go-to writer on the joys and challenges of family, motherhood and modern life, in her nationally syndicated column, Life in the 30s. The Pulitzer Prize-winning columnist and No. 1 New York Times bestselling author now is taking the next step, bringing her sensitivities and writing to the state of grandparenting. Rapper Flo Rida will perform at Naperville Ribfest’s on July 4. Known for songs like “Low,” “Club Can’t Handle Me” and “Right Round,” the four-time Grammy nominee is the third main stage artist to be announced for the annual festival. Tickets are on sale at ribfest.net. Early bird price is $20. Ribfest runs July 3 to 6 in Naperville’s Knoch Park. Ribfest is a fundraiser for the Exchange Club of Naperville. Country music star Brantley Gilbert and rocker Billy Idol were announced as main stage headliners in January. Tickets are already on sale for Billy Idol’s July 3 performance and Brantley Gilbert’s July 5 show. Local residents have until March 4 to apply for the Wheaton Police Department’s Citizens’ Police Academy. The free 10-week program gives participants hands-on experience with police work, including traffic stops, critical incidents and forensics investigations. Students will learn how and why police officers do things, and give them an opportunity to connect with police officers on a personal level. Classes will be held every Tuesday from 6:30-9:30 p.m. in and near the Wheaton Police Department building starting April 4. Participants will participate in a graduation ceremony when program ends. Twenty spots are available. To be considered, applicants must be at least 21 years old and live or work in Wheaton. Applicants must go through a criminal background check to be eligible. Interested residents can online at wheaton.il.us or can print and mail an application, also available at wheaton.il.us. Applications can be sent to Wheaton Police Department, Attn: Patricia Potter, 900 W. Liberty Drive, Wheaton, 60187. Glen Ellyn School District 41 is looking for a new superintendent and seeking the public’s opinions about what kind of superintendent they want. Two focus groups will be held to gather those opinions. All District 41 residents are welcome to attend the focus groups led by search firm BWP and Associates. The focus groups will be held on Feb. 21, at 2 p.m. at the Central Services Office, 793 N. Main St., and at 6:30 p.m. at Hadley Junior High School, 240 Hawthorne Blvd. On March 7, District 41 board members will review the first round of applications for superintendent. Interviews of potential candidates will start on March 9. District 41 will begin its final round of interviews on March 11.